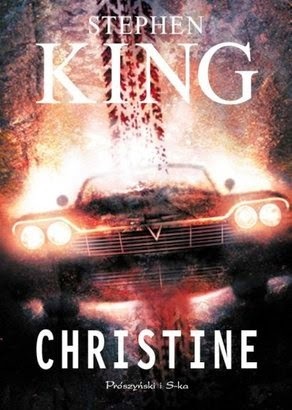 Christine is the first of King's 'car' novels. Originally published in 1983, it presents a story of a complicated relationship between a teenager and... his vintage car. The novel starts when two teenage boys are riding home from work. One of them, a nerdy type called Arnold "Arnie" Cunningham, notices an old, badly damaged Plymouth Fury parked on a lawn in front of a house. He immediately becomes fascinated with the vehicle and is determined to buy it. As Arnie finishes the process of buying the car, his best friend Dennis sits in the car and has a kind of vision that leaves him disturbed. He instinctively feels bad about the car, which the previous owner calls Christine. The car is delivered to Will Darnell's garage. It's a place of dubious reputation and its owner is suspected of illegal activities. Arnie begins the process of restoring his car there. As he gets more involved in the process, his relationship with his family, best friend Dennis, and later even his girlfriend Leigh, is seriously affected. As usual, King sets up a solid background for his story. The story is told from Dennis' perspective.The major part of the novel consists of descriptions of everyday life of the protagonists. I was a bit surprised by a focus on negative aspects of high school life. I don't know whether this reflects the author's experiences but it seems that extreme forms of bullying, use of alcohol and drugs are always present in his novels about children and teenagers.